Happy New Year! We hope both you and your business got off to a great start this January. To help you reach your marketing goals we’re excited to tell you about a special offer on Babyology’s social media advertising. Our Facebook community continues to grow in number and engagement. Last week we hit a milestone of 200,000 fans! 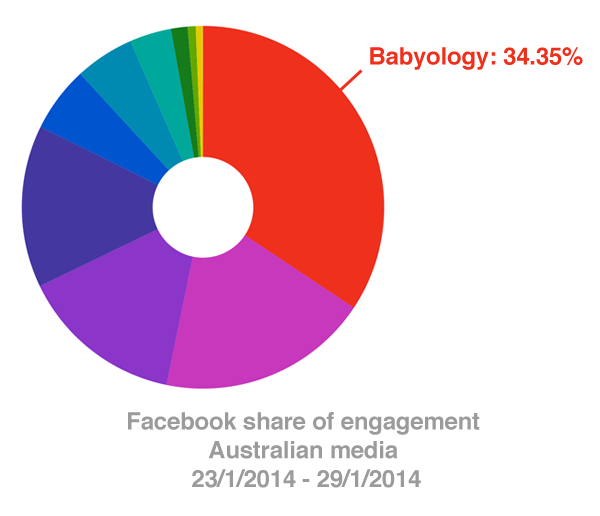 We also have the highest share of engagement of all Australian media, with Babyology accounting for 34.35% of all Facebook engagement for the week (source: Social Pulse). Click here for a detailed version of the chart. To celebrate these achievements, we’d love to offer 20% off our regular social media broadcast and package prices. This means you can reach our highly-engaged community of over 200,000 people for only $400 + GST or $800 + GST for a package which includes two social media broadcasts and 60,000 side banner impressions. This offer applies to new bookings made between January 30 and February 28, 2014. Posts must run by the end of June, 2014. If you’d like more information on advertising packages, please click here. If you have any questions, thoughts or ideas regarding advertising on Babyology or would like to discuss a custom package, please reply to this email or contact us at advertise@babyology.com.au.